You’ve heard of cloud computing, right? I have three computers because I hate getting rid of technology. Well, four if you count the old laptop buried somewhere deep in a closet. Two desktops, one from 2008 and one from 2011 and another laptop from 2013. They were necessary when I ran my retail business. Had to have one at the shop and one at home. When I “retired” I needed to get the laptop, thinking I would use it for my traveling photography business. As a computer user since the 1980’s imagine how much digital information I’ve gathered over the years. Thankfully, hard drives have gotten bigger and cheaper so storing much of the data is far easier than it used to be. Yesterday the 2008 desktop gave up the ghost. It is a scary feeling when a computer goes kaput. The Eight as I used to (affectionately) refer to it (now the adjectives are far more salty) had a pretty good run. As a matter-of-fact we had just finished collating the last year’s taxes for preparation. Yes, I know what you’re thinking and you are right, I DO wish I had printed my tax stuff before I shut the machine down. Good thing it wasn’t THAT important. It was only tax information after all. What if it had been my great American novel? What if those hard drives were full of my journals and writings? Without a backup, I’d be a gonner. My book would never be turned into a screenplay. Johnny Depp would get never get cast in the leading role. His acting comeback would fizzle and he’d spend the rest of his days playing rock ‘n roll with the band you saw on the Grammys last night. He would die far too young and…..wait, wait. Sorry, getting a little carried away here. I’m not really sure Mr. Depp is right for the protagonist in my novel. And, besides, all my writing is up on the Cloud now. It’s all safe. Google and Microsoft with their Google Drive and OneDrive products insure that what I write is safe no matter what (excluding Armageddon, of course). Of the two free services, I prefer Google Drive, but I use them both. The Docs app allows me to write on any device, computer, iPad, even iPhone. If you are not connected to your drive, it won’t let you write. And, every keystroke you make is backed up immediately. If you type something on your iPad while your computer is turned off, once you flip your computer switch on, the files sync up. There are storage limitations, but I’ve been using Drive for years now and have barely used 50%. When you create a doc in the Google Doc app it does not go against your memory limitations. Microsoft has a couple of good tools too. Their OneDrive offers competitive storage and can take Word and Excel docs. The Microsoft OneNote app is quickly finding its way to the top of my app chart. Get an idea you want to jot down quickly? OneNote is perfect for this. It even has tabs so you can separate notes my subject. With Cloud computing the need for a large computer and hard drive is going away. Let the experts store this stuff. They have so many redundancies something major would have to happen for me to lose anything. Once I don’t need a computer anymore to store my writings I can go back to putting my tax stuff in an old shoe box. I hate traffic. (Who doesn’t right?) And, my sense of direction is lousy. 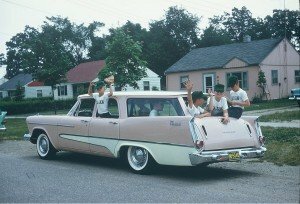 Growing up in the 60’s in a family of seven we owned the now extinct “station wagon”. If you’re old enough you will remember the three sets of seats. The front seat of course for Mom, Dad, and the baby. The middle seat for older sister and brother, and the rear facing back seat for my brother and I. It’s difficult to develop a good sense of direction when you spend the majority of your time looking at where you’ve been instead of where you are going. Recently, we had the opportunity to travel south to Irvine for a media event I was covering for my Whoa Podcast. It is a circus of sorts called Odysseo by Cavalia. A show that might be described as Cirque de Soleil with horses. The event was scheduled to start at 10:45 and, according to the Waze navigation app on my phone, traveling time was 2 1/2 hours. My wife, Ranae was joining me. After a little discussion, we added another 40 minutes for traffic just to be safe. With the Waze app on we took off. The app will notify us of police on the road or traffic hazards and will give us turn-by-turn directions. So, we essentially sat back, pushed play on a Chris Hardwick Podcast, and enjoyed the early morning drive. Coming off the Grapevine on the Los Angeles side the phone woke up and Waze announced there was a “major accident” on our route and gave us an alternative way to go. We weren’t familiar with the venue location of Odysseo, but we allowed Waze to change our course and steer away from the accident. About a half hour later we had no clue where we were. Waze still had us arriving on time (Oh yes, it gives you your expected arrival time), so we just blindly followed along with her instructions. As we drove along I thought about Ranae’s uncle, Tom. I wondered what he would have thought of all this. Tom would come visit us and the first 30 minutes following his arrival was a recap of the route he took. “Well, had to take the 710 to the 170 because we left a little later than we wanted and we were smack dab in the middle of rush hour,” Tom would say. “We shot over to the 134, hit the 210, and got on the 5.” Tom new all the freeways like the back of his hand. “On the way home, we’ll need to stay on 5 to the 2, take the 10 to the 605, then back to the 5 to get around the Dodger game at Chavez Ravine.” He knew where the major factories, ball parks, amusement parks, and bottlenecks were all located. At exactly 10:47 we pulled up to the entrance of Odyesseo. You can’t miss their big top. Our little phone app had gotten us there pretty much as she promised. Not nearly as much fun as Tom. Tom was a genius about traffic. Come to think about it, I wonder if they fashioned the Waze app after him.